Living a healthy, happy life beyond 50 requires a few lifestyle changes and considerations for most men. As the body ages maintaining good overall health requires regular health check-ups, health screenings and an altered diet and exercise program that promote a healthy cardiovascular system. One of the most common health problems experienced by men over the age of 50 affect the heart. The health of your cardiovascular system (heart) is dependent on several other factors, including diet and exercise habits. Your diet should include plenty of fiber, water and lean protein. Add green leafy vegetables, low glycemic fruits and complex carbohydrates to your diet while limiting intake of simple carbohydrates like sugar, white flour, pasta, rice and bread. Complex carbohydrates are rich in whole grains – perfect for boosting cardiovascular health. In addition to altering your diet, you need to exercise often. 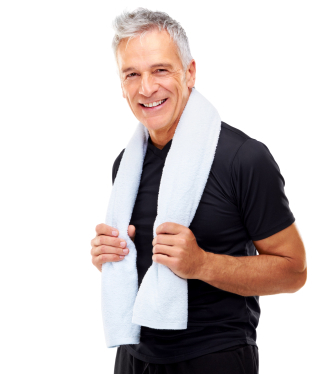 Some men are scared to start a new exercise program when they are 50 or older. Check with your doctor before starting a new exercise program, but rest assured that even patients who’ve suffered heart attack, stroke and even organ transplants are advised to exercise on some level – so exercise is safe for nearly all men over the age of 50. Exercise does not have to include marathon running, bodybuilding-style weight lifting or sprinting on the treadmill. Starting light could include walking 5 to 10 minutes each night after dinner and working up to more strenuous exercise as your health and doctor allows. Smoking and excessive alcohol intake can have a detrimental effect on health. Minimize alcohol intake and stop smoking to live a longer, healthier life. Talk to your physician about smoking cessation methods appropriate for your current health and specific needs. Alcohol consumption is considered healthy, by some doctors, in moderations – so talk with your physician about the best means of reducing alcohol intake.